First meeting of Europe X in Budapest, Hungary. Ministry in Europe and the Middle East looks very little like ministry in other parts of the world. While churches in parts of the world preach and teach the message of Jesus in cultures already somewhat receptive to Christianity, the experience of pastors and church leaders in countries like France and Spain can be drastically different, difficult, and confounding. As a result, limited support structures have existed in recent generations to encourage and equip young men and women called into ministry. To come alongside these developing leaders, the Church of God in twelve countries came together to launch the Three World Leadership Network (3WLN). Since then, Church of God missionaries and young leaders have made strides toward revitalization of the church through partnership, awareness, networking, and encouragement. Earlier this year, they took the next step to invest specifically in young pastors and church planters passionate about multiplication in the midst of a challenging post-Christendom reality. The Three Worlds Leadership Network has already been a catalyst for the work of God in the region. For too long, the aging demographic of European congregations, combined with few efforts to reach young people, posed a threat to the region: could many of these churches survive one more generation? 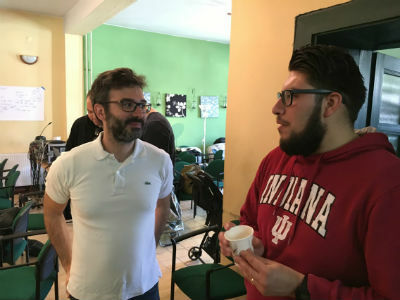 At the very least, the church’s witness had grown nearly silent in what Patrick Nachtigall, regional coordinator for Global Strategy in Europe and the Middle East, calls an “extremely challenging” situation. “We felt we needed to proactively encourage the whole region to invest in young leaders,” Patrick explains, “and provide a safe place and support system for them as they do ministry in difficult, lonely places.” To this day, these leaders connect regularly on social media, through the Three Worlds team, and at a conference every eighteen months. But the plan was always to launch sub-groups under the 3WLN umbrella to address more specific needs. Europe X encourages and equips young pastors of the region. 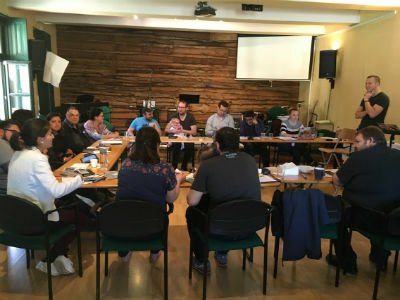 The first meeting of Europe X, coordinated by Daniel and Christy Kihm (missionaries to the Netherlands), took place in the spring in Budapest, Hungary. Representatives came from England, France, Spain, Italy, Hungary, and Russia, from a total of nine churches. “The meeting was not only about connecting and encouraging each other as pastors working in a difficult region,” Patrick reflects, “but it was also about analyzing their particular churches and the strengths and weaknesses of their context.” Additionally, assessments of churches were completed, reports were given from each church, and an overview of the failure of evangelicalism in Europe was discussed. Thank you for your prayers for the Church of God in Europe and the Middle East! Learn more about Europe X and the Three Worlds team at www.chogglobal.org and www.three-worlds.com. This entry was posted in All Church of God, Global Strategy and tagged 3WLN, England, Europe and the Middle East, Europe X, Europe-Middle East, France, Holland, Hungary, Italy, leadership development, Netherlands, networking, Patrick Nachtigall, post-Christendom, post-Christian, Russia, Spain, support, Three Worlds, Three Worlds Leadership Network, young leaders, young pastors. Bookmark the permalink.